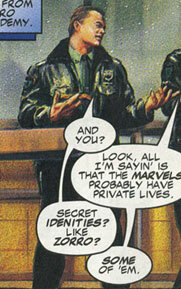 Powers/Abilities: Lt. Piper had no superhuman powers, but was a skilled police officer and undercover agent. He once was equipped with a concentrated neuron plasma field projector by the Invisible Woman, in the absence of the rest of the Fantastic Four. History: (Code of Honor#1) - On his first day as a police officer, Jeff Piper was introduced to his partner, Mike Badalino, and the two responded to a code 606, meaning that it involved a superhero. 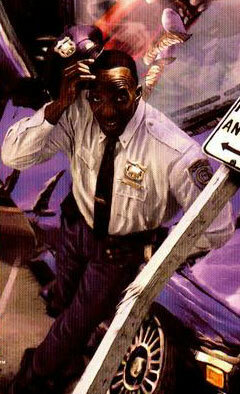 When the two arrived on the scene, they witnessed Luke Cage, the Hero for Hire, busting up a crack house. Despite being proud to see a black man as a hero, Piper couldn't help but feel somewhat useless with a superhero on the scene. As Mike closed off the fire hydrant that some local kids had opened to play in the water, Piper looked up and noticed the Angel flying overhead. After work, Piper returned home to his parents and explained to him why he chose a job as a police officer, instead of a clergyman. As time went by, he noticed that New York had become a breeding ground for heroin junkies and was even chosen to suit up in riot gear to protect the citizens from a battle involving the Thing and the Sub-Mariner. Not long after, Mike and Jeff were called in during a bank robbery. During the robbery, Piper knocked out the robber attempting to save bank teller Janet Ruiz. After handcuffing the crook, Ms. Ruiz angrily yelled at Piper for knocking the crook out, claiming that he could've angered the crook into shooting her. (Code of Honor#1/Marvel Team-Up I#19-20 - BTS) - As time passed, crime got increasingly worse and Piper and other policemen watched on television as Spider-Man and the Black Panther battled Stegron the Dinosaur Man and his small army of prehistoric creatures in the middle of Midtown. Following the dinosaur attack, a local man confronted Mike and Jeff during their shift and demanded that they do something his neighbor's dog. The two policemen investigated the dog reports, finding a live velociraptor in a nearby alley. (Code of Honor#1/Daredevil I#108-109 - BTS) - Afterwards, the two men went to a local bar to relax and a drunk Mike nearly got into a fistfight with another cop named Muldoon over the methods of a new vigilante calling himself the Punisher. Soon after, Jeff Piper began dating Janet Ruiz, the woman he saved at the bank, and the two went to see "The Exorcist" at a local theater. On their way home, the two witnessed a battle between Daredevil and the Beetle, where they had to dive for cover due to falling debris. 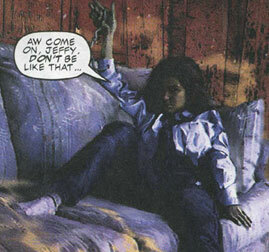 (Code of Honor#1/Werewolf By Night I#32 - BTS) - Later, during a night where his partner Mike had gotten himself drunk again, Jeff Piper noticed a car that seemed to be in trouble. When he asked if the car's driver was having car trouble, the driver replied that they were waiting for someone. He then asked him for his license and registration. At that point, the back window rolled down and Wilson Fisk told the driver to give Piper something for his trouble. The driver then dropped a $1000 dollar bill on the ground and sped off, leaving Jeff to question. Before he could think about it too much, he and Mike were called in to investigate a disturbance at Columbia University. Arriving on the scene, Jeff and Mike were shocked to see that the disturbance was being caused by the Werewolf by Night, who escaped into the night, trailed by the Moon Knight. That night after Jeff had returned home, he questioned himself about what to do about the $1000 that Wilson Fisk had given him and whether or not it would be considered dirty money if he spent it. (Code of Honor#1/Marvel Team-Up I#23 - BTS) - During his next work day, Jeff considered buying Janet a wedding ring with the $1000, but was stopped when Mike arrived with a call to help with a superhero battle between the Human Torch, Iceman, and Equinox. (Code of Honor#1) - Following the wrap-up of the battle, Jeff met Janet and the two went out for dinner with his parents, where Janet became angry at how Jeff's mother treated her like a Hispanic racial stereotype. Janet eventually left the table and Jeff went after her, trying to explain how his mother was. Angry at Jeff for not standing up for her, Janet left him. In order to deal with this loss, Jeff volunteered for every shift available on the force in the weeks that followed, bringing him into conflicts involving the Wrecking Crew, the Falcon, and the Hulk. During one such shift, he and Mike responded to a call of "shots fired" and watched in horror as the criminals were gunned down before their eyes. Jeff investigated further and came face-to-face with the Punisher. The two stared each other down for minutes until Jeff decided to let the Punisher go and returned to Mike's location claiming that he had never seen the gunman. That night he returned home and watched on television a confrontation between Spider-Man and the Punisher while desperately wishing to see Janet again. After much thought, he decided to surprise Janet at her house at three in the morning, where he proposed to her. (Code of Honor#2) - While contemplating whether or not to spend the $1000 on he and Janet's wedding, Jeff Piper was called in with a group of New York City policemen to help guard Avengers Mansion from protesters, who had lined up in protest of the marriage of the Vision and the Scarlet Witch. During the increased work hours, he and Janet visited the Catholic priest Father Delgado to see if he might be able to wed them. Father Delgado agreed on the condition that they not be wed in the church, as Jeff was a Baptist. That night, as Daredevil and Black Widow battled a group of thugs, Mike and Jeff investigated a group of crooks that were stopped by Spider-Man. Following the apprehension of the crooks, Jeff was promoted to the organized crime bureau of the NYPD under Det. Sgt. Rizzo in order to bring in a new face to go undercover and find out information on Jake Vicuna, a man with criminal ties to the Carbone crime family. After telling his parents about his promotion, Jeff spoke with his father about how his mother was upset about his impending marriage to Janet. When he let slip that a Catholic priest was marrying them, Jeff's mother dropped a handful of dishes. Jeff ran into the kitchen to find his mother crying, claiming that Jeff didn't care how she felt about the marriage. Months into his undercover assignments, Jeff noticed the Punisher entering Jake Vicuna's location. Against orders, Jeff ran inside and found the Punisher gunning down groups of mobsters. The two once again came face-to-face and this time, Jeff shot the Punisher out the window. After the Punisher was nowhere to be found, Jake Vicuna thanked Jeff and claimed that he now owed Jeff one. Jeff quickly responded that Jake didn't owe him anything and as soon as he returned to the station, Jeff was stripped of his promotion and dropped back down to lieutenant status. Soon after, he and Janet went shopping for furniture for their new apartment, where Jeff once considered using the $1000 to buy her a new couch. (Code of Honor#2/Uncanny X-Men#135 - BTS) - He eventually decided against it and during his first call since being demoted, Jeff and his new partner Archie were sent to the townhouse of Sebastian Shaw, who claimed that the mutant X-Men had entered his townhouse unlawfully. As Jeff and Archie questioned Shaw, Jason Wyngarde was wheeled past them ranting about "stars all around him." A nearby man confronted them and claimed that he had something for them to see in the sewers, Archie volunteered Jeff for the job and Jeff followed the man into the sewers, where they found the sewer clogged with the dead bodies of Hellfire Club guards, apparently having been slashed to ribbons. Upon returning to the surface, Jeff witnessed Storm and the fiery form of Dark Phoenix. (Code of Honor#2) - Soon after the trouble at Sebastian Shaw's townhouse, Jeff married Janet Ruiz in the rectory of the Holy Ghost Church by Father Delgado. While there, Jeff was informed that the bill for the wedding was taken care of Jake Vicuna, who claimed that he was just repaying Jeff for his help with the Punisher. After the wedding, he and Janet went to Atlantic City for their honeymoon. Upon his return, he and Archie investigated the murders committed by the assassin Elektra and he and Janet moved their belongings into their new apartment in Harlem. After the retirement of Archie and the upswing in heroes who seemed out of the ordinary, Jeff sought solace from the world at the Holy Ghost Church, only to leave upon seeing Father Delgado speaking with the new vigilantes Cloak and Dagger. Not long after, Jeff discovered that his old partner Mike Badalino had been critically injured in a gunfight at one of Jake Vicuna's drug labs and before visiting him in the hospital, Jeff was given a suggestion to transfer away from that precinct. Returning home afterwards, Jeff was given the news by Janet that she was pregnant. (Code of Honor#3/Thor I#308 - BTS) - A few years later, after his first and second children were born, Jeff was still on the beat with his new partner, Chick Hamner. As they discussed whether or not the local superheroes had secret identities, Thor flew over them in the strangely out of season June snow. (Code of Honor#3) - Upon returning to his home in Harlem, Janet complained about how the neighborhood had gone bad since they had moved in and that it was no place for their children to grow up. When he yelled at his son for calling him fat, Janet yelled back, prompting Jeff to leave once again. She angrily responded that if he left them, he shouldn't her and the kids to be there when he got back. Jeff ended up moving back in with his own parents and continuing his police work. Soon after, Jeff and Chick spotted an arrest in progress and Jeff immediately recognized the criminal as Jake the Rake, the man who tried to "repay" Jeff for stopping the Punisher during Jeff's time doing undercover work. When Jake was taken in for questioning, Jeff entered the interrogation room and punched Jake, blaming all of his life's problems on Jake. That night, he once again looked at the $1000 that Wilson Fisk had once given him and spoke to his dad about what he was going to do without Janet. (Code of Honor#3/Amazing Spider-Man Annual#15 - BTS) - Not long after, Jeff and Chick were called to Pier 43 to stop the Punisher. After a few minutes of staring Jeff and his squad of police down, the Punisher gave up and turned himself in. When Chick told the Punisher that they'd probably put him behind bars for life, the Punisher replied by saying that there were a lot of criminals in jail. (Code of Honor#3) - Days later, Jeff happened to pass Janet on the street and apologized for everything he had said and the two shared a passionate kiss as they were bathed in a mysterious light that seemed to strip New York of its mainstream superheroes. With the superheroes missing, Jeff pulled extra long shifts at the NYPD, helping in battles against the Ani-Men, Slyde, Shocker, Electro, Scorpion, Juggernaut, and Tiger Shark. The NYPD was soon donated a large amount of scientific weaponry by the Invisible Woman, who hoped that her husband's inventions might be of use against the stronger supervillains who had taken advantage of the disappearance of many of the superheroes. Using the new technology, Jeff and Chick were able to help in fights against Stilt-Man, the Rhino, Whirlwind, and Plantman. While Jeff was out trying to protect the city, his home was robbed which prompted Janet to move herself and the kids to New Jersey with her sister. Attempting to fix the situation, Jeff flashed the $1000, but Janet said that he had become part of what the city had become and drove off. Chick quickly reminded him that they had another call and when they arrived, they found Abomination tearing up the city. Chick tried out the gun given to them by Invisible Woman, knocking Abomination back into a police car. An angry Abomination quickly crushed Chick with a car and punched Jeff out just as Doc Samson arrived to stop Abomination. Seven days later, the superheroes returned from their disappearance and Jeff attended the funeral of Chick. At the funeral, Jeff attempted to talk to Janet but she refused. A recovered Mike Badalino saw Jeff and offered to buy him a drink and the two left towards a bar, where they watched a parade in the returning superheroes' honor. After Jeff attempted to buy another round of drinks with his $1000 and was turned down due to lack of change from the bartender, Mike suggested they hit Valiant's and Jimmy Duffy's, and the two left for a night on the town. (Code of Honor#4/Avengers I#249 - BTS) - Depressed, Jeff sat around his apartment while another summer snowstorm covered the city. He was soon interrupted by a call from the NYPD, asking him to come down and help hold the line while the superheroes fought off a demonic invasion. Once in uniform, Jeff found that his former partner, Det. Michael Badalino, was also called in to help. Jeff and the other police attempted to fire on the demons, but they just laughed at the police until Lady Sif of Asgard arrived and sliced down the group. (Code of Honor#4/Fantastic Four I#278 - BTS) - The following weekend, Jeff got to see his children and took them to see the new "Indiana Jones" movie. After the show, he took them by the Baxter Building and while there, it was launched into the air causing Jeff and his kids to dive for cover. When he returned the kids home, Janet angrily told him that he couldn't see the kids anymore for putting them in danger. Soon after, Jeff was partnered with a female cop named Ann Coyle and the two was present when the cosmic Beyonder walked through the city on air. As he ushered people away from the commotion, he helped arrest a drug-addled man claiming to be the Hulk. After the arrest, Jeff and Coyle went to their usual cop bar, who called him by his first name. Feeling uncomfortable, Jeff suggested that he leave, explaining that why he was seperated, he was still married. As he left, he looked up and noticed a now metallic-winged Archangel flying overhead. When he returned home, he asked why his parents were still up and they explained that the X-Men had died in Dallas. When he quipped about less muties to worry about, his mother preached at him about tolerance and he angrily yelled back at her about her dislike of Janet. Later, he and Ann were on duty when they spotted a demon carrying a mannequin across the street and when he asked Coyle to start the engine on their car, she explained that it wouldn't start. Jeff tried to take a look at the engine and was nearly bitten in half by a demonically-possessed hood. After "killing" it by shooting at it, Jeff watched as Coyle took off running, terrified. When Jeff finally found Coyle, she seduced him and the next chance he got, Jeff demanded to switch precincts. Leaving, Jeff was confronted by Janet, who explained that after a visit from Jeff's mom, she thought that they belong together but Jeff said that she deserved better after his night with Coyle. After that, Jeff and his new partner in Brooklyn responded to a domestic call where he knocked out the wife-beater and arrested him. The wife explained that he'd be right back to hurt her again and Jeff decided to give her the $1000 that he had held onto for years. Subsequently, Jeff did some time as a prison guard where he was witness to Wilson Fisk being arrested for criminal trespassing as a vagrant. He soon returned to Janet and asked if she thought they still belonged together. They shared a kiss and prepared for a new start. Comments: Created by Chuck Dixon, Tristan Shane, and Brad Parker. Archie, Krager, Andy McLean, & Det. Sgt. Rizzo all created by Chuck Dixon, Terese Nielsen, and Vincent Evans. Chick Hamner & Tim created by Chuck Dixon, Bob Wakelin, Derick Gross, and Paul Lee. Mister Ambrose, Ann Coyle, & Henry created by Chuck Dixon and Brad Parker. The Brothers Grimm (Grimes) weren't active yet during the Secret Wars. Maybe someone else used the costumes and then brought them back where they were found by the Grimes brothers. Mister Ambrose was an older man who ran a store that had been robbed. Jeff and Ann Coyle investigated the robbery with Ann questioning Ambrose as a witness. Ambrose explained to her that he was robbed by "punks" who took some jackets and almost killed Mrs. Klein on the way out. When asked what they were wearing, he angrily replied that they were wearing his jackets. 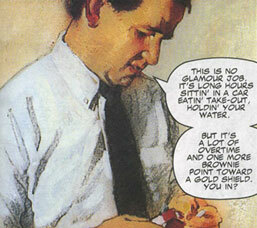 Archie was Jeff's partner when he returned to normal police work after he brief stint with the organized crime bureau. Archie was a veteran police awaiting his time to retire. 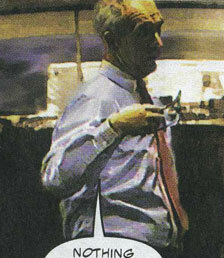 He and Jeff investigated a call from Sebastian Shaw of the Hellfire Club about the X-Men crashing in on them. While they were there, Archie and Jeff came face-to-face with Storm of the X-Men as the X-Men battled the Dark Phoenix. The two also investigated a series of murders committed by Elektra the assassin. After the Elektra incident, Archie retired. Ann Coyle was Jeff's final partner while he was in the Harlem precinct. She was partnered with him during the demonic invasion of New York, where she ran for safety. When Jeff found her, she seduced him, prompting Jeff to ask for a precinct change the next day. Chick Hamner was another of Jeff's partners. He was partnered with Jeff when the superheroes went missing and helped in many fights against the various supervillains who had tried to take over in their absence. During a battle with Abomination, Chick blasted him with a gun created by Mister Fantastic, angering Abomination enough to crush Chick with a tossed car. Henry was the officer who brought in Wilson Fisk after Fisk was arrested for criminal trespassing. Krager was a fellow police officer with Jeff Piper. When Jeff's old partner Mike Badalino was injured in duty, Krager was the one who told Jeff that it was at one of Jake Vicuna's lab. He then commented that Jake was one of Jeff's pals which Jeff denied. Andy was Jeff's partner while Jeff was with the organized crime bureau of the NYPD. He was present when Jeff busted in on the Punisher and inadvertedly saved the life of Jake "The Rake" Vicuna and was pretty steamed when Jeff blew their cover. Lewis was Jeffrey's father who was always there for Jeffrey when he needed him. Originally, Jeff lived with Lewis & Mrs. Piper until he could afford to move out with his new wife, Janet. Once Janet and Jeff were seperated, Lewis tried to get Jeff to get out of the house and told him to just call her. Jeff's mother was very old-fashioned and because of her views, was very negative towards Jeffrey marrying a Hispanic Catholic. She loved her son very much and often spoiled him. Her dislike of Janet eventually caused her and Jeff to argue and eventually, once she saw how much Jeff loved her, Mrs. Piper visited Janet and explained how much of a wreck Jeff was without her and how much Jeff loved her. Mrs. Piper's words helped Janet to decide on giving Jeff another chance. Det. Sgt. Rizzo was responsible for Jeff's transferrence to the organized crime bureau. He met with Jeff right after Jeff and his partner had a run-in involving Spider-Man. Possibly intended to be Daniel Rizzo, older brother of Thomas Rizzo. 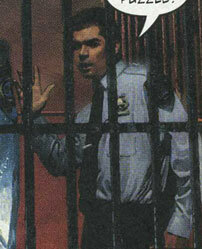 Tim was one of the police officers who interrogated Jake "The Rake" Vicuna after he was arrested. He was present when Jeff entered the interrogation room and punched Vicuna. Afterwards, Tim helped pull Jeff off of Vicuna.